On a recent trip to London I stopped by the Whole Foods Market on High Street Kensington. It is like a treasure trove for Foodstuff Finds and I managed to pick up a few interesting items for my basket. A lady doing demonstrations asked if I liked coffee, and as a caffeine lover I felt obliged to see what she was offering. 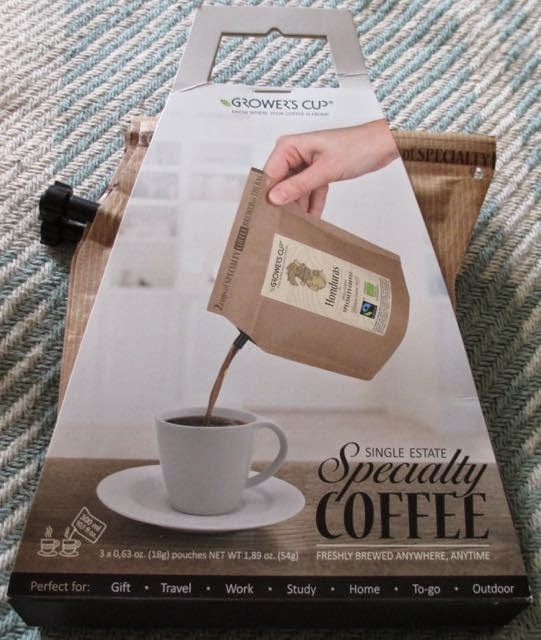 This is more about coffee delivery than anything else, it a unique product that makes two cups of fresh coffee without the hassle of needing a cafetiere. So perfect if you are staying at a hotel and aren't much of an instant drinker. 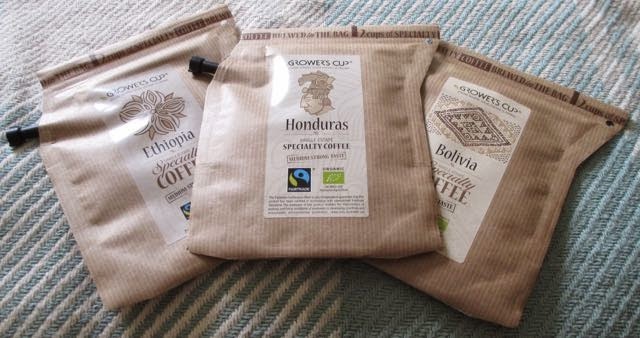 The coffee bags are sold in sets of three and come in at under £3 depending on the variety, so less than £1 per bag. I went for a mixed set. I had a look at the instructions and put the kettle on. First thing was to simply click the lid from the spout off, it came away easily and let out the first aromas of fresh coffee, lovely. Next I opened up the top of the bag. It was fairly firmly sealed and I had to gentle prise it, even then it seemed not to open fully. Inside I could see freshly ground coffee sitting near the top of the bag. I poured water through the top very carefully, as the gap needed encouragement from my fingers. I thought I wouldn't be able to work out how to make the bag stand, but as the water was added it filled out and stood fine. There were lines of the back of the pack showing fill levels, for strong and mild etc. I ended up choosing the mild option more because I could see there wasn’t much water in the bag and I'd promised to share. I noticed that the imagery on the packaging was of very dainty small white cups, admittedly the kind you do get in hotels, but not the kind my Starbucks generation are used too. 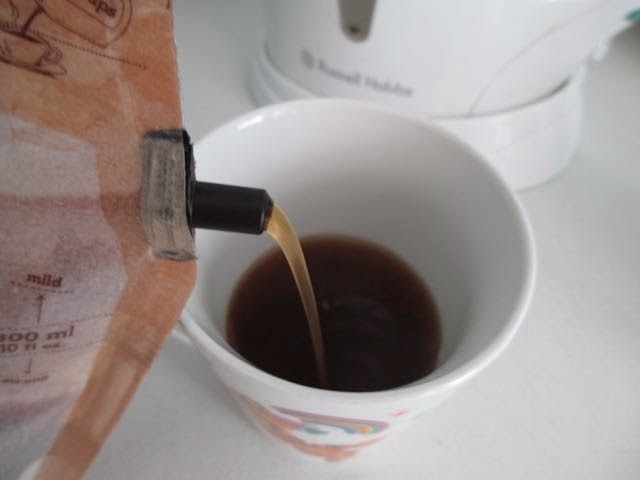 Anyway I pressed the top of the bag to let it close and brew. I poured out two small cups worth, into mugs, which ended up looking a bit empty. 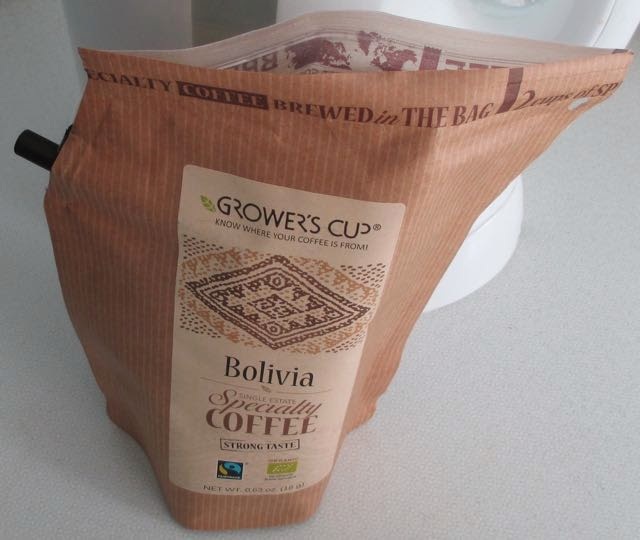 The coffee was lovely though, I went for the Bolivia first and even at the mild setting was still rich and tasty. I've since tried and enjoyed both the other options Honduras and Ethopia both of which also provided a lovely cup of coffee. I can't criticise the contents of the bag one bit, they did genuinely make a good brew, it is just the size I have a problem with. I would much prefer it if the bags were large enough for two mugs worth of coffee, then these would be a regular treat for trips away.